The Forbes family has been a part of the automotive history since the beginning with the involvement of Automotive pioneer Russell Arthur Forbes. In 1915, at the age of 18, Russell Arthur Forbes became employed by the “Ford Nickel and Dime Bank” in Dearborn Michigan. During the next 12 months, Russ had the pleasure of dealing with Mr. Ford regularly as he made his daily deposit to his Bank, and this lead to Henry recruiting Russ to serve on Mr. Ford’s secretarial staff. While in this capacity, Russ was given the responsibility to be the Manager of Mr. Ford’s newspaper “The Dearborn Independent” and then he worked with Mr. Ford on his first housing subdivision development, also in Dearborn. Russ’s final duties before leaving the Ford Motor Company were as Henry’s personal assistant. Of special interest, was the involvement of Russell Forbes with Mr. Henry Ford during the million-dollar libel suit against the Chicago Tribune newspaper in 1919. At the time, Russell Forbes was Mr. Ford’s personal Business Manager, and Mr. Ford, to avoid being subpoenaed to appear in court, had a train car fitted as an office that constantly was being moved. If they could not find Mr. Ford, they could not serve Mr. Ford to appear in court. Russell Forbes secretly met with Mr. Ford every evening at a different location, to bring the business of the day to Mr. Ford. Ralph Forbes, Russell’s youngest son, remembered accompanying his father, as a small lad, to these meetings and recalled sitting on the train car steps as his father and Mr. Ford conducted the day’s business. Mr. Ford eventually won his suit again to the Chicago Tribune and was awarded only six cents as damages. In 1921 Russell A. Forbes left Detroit and the Ford Motor Company and moved to Tilbury Ontario, where he and his brother Stanley C. Forbes, assisted by one employee, began selling Ford cars and parts. Soon after opening the business in Tilbury, the brothers built a 100’x40′ garage with a cinder floor. They worked out of this building for the next four years after which they moved the business to St. Thomas Ontario. On December 31, 1924, the brothers hung the “open for business sign” in the telephone city, Brantford Ontario. The business was located at 303 Colborne St. for the first two years, and in December of 1926 the brothers acquired a lot in building on Darling Street in Brantford. In 1932 a service station was added and four years later in 1936 they added a used car lot. Henry Ford made numerous trips to Brantford to visit “his boys” as he referred to Russ and Stan, and on one of these trips it was reported that he attempted to recruit Russ back to the Ford Motor Company offering him the responsibility to head up Ford’s operations in Australia. He turned this down! 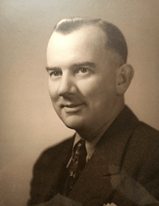 In 1940 Russell left Brantford, and his brother Stan, to become the Dodge De Soto Dealer in Kitchener, purchasing Geissler Motors, located at 10 Water Street in Kitchener. He operated under the name R. A. Forbes Motors for 3 years up until his death. Russell passed away a young man in May, 1943 leaving his Wife Ainslie, two sons Jack and Ralph, and a daughter Francis. 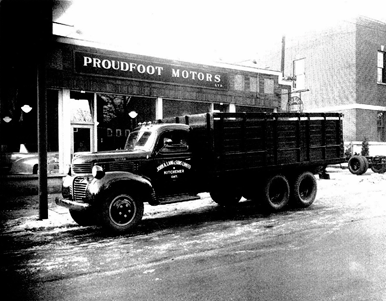 After serving in the WWII, Ralph and Jack upon their return home, cut their teeth in the retail car and truck business by working for Proudfoot Motors who was now the Dodge Desoto Dealer in Kitchener. 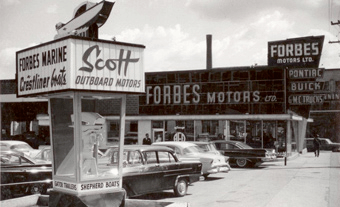 On July 6, 1948, Ralph and Jack Forbes opened the doors of Forbes Motors. 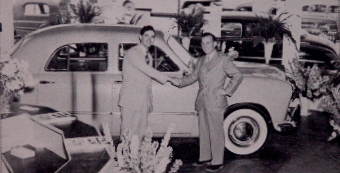 This picture was taken on new car announcement day in 1948 in Welland. 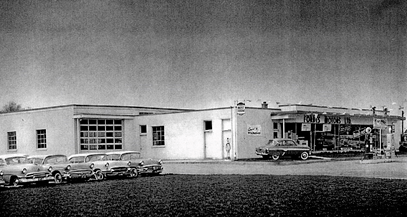 In 1948, the Brothers applied to became Ford Dealers in Welland Ontario. 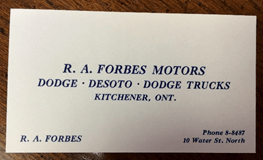 At the age of only 23, Ralph Forbes became the youngest Ford Motor Company Dealer in Canada, and along with his older brother Jack, they opened Forbes Motors Ltd. in Welland Ontario. In 1952, Forbes Car Lease Ltd., a subsidiary of Forbes Motors, was established, and today has a substantial fleet of leased vehicles of all makes and models on the road. The old Halwig Motors on Victoria St, Kitchener in 1955 after signs were changed to Forbes Motors Ltd. 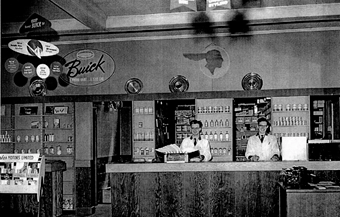 In 1955, Brothers’ Ralph and Jack purchased Halwig Motors Ltd. An established Pontiac Buick dealership on Victoria Street in Kitchener. This was a very major decision for the boys as they had always represented the Ford Motor Company in the past, and a move to another Manufacturer was significant. Kitchener-Waterloo offered them a much larger market and opportunity, and it was a return to home for both Mrs. Forbes. Ralph’s business card of the day. Dealer trunk lid logo from 1955 – 1970. 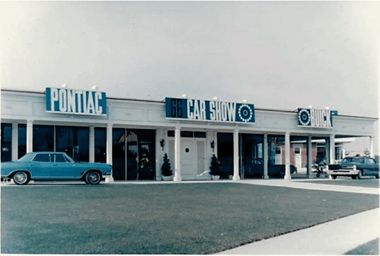 Outgrowing the Victoria St facility, 10 years later in 1965, they relocate the Dealership to the present location at 165 Weber Street, North in Waterloo. The new facility was state of the art and was one of the most modern in the country. Done in a very Colonial style, it was copied by many other dealers who were renovating at the time. New dealer trunk lid logo 1970 – 1980. 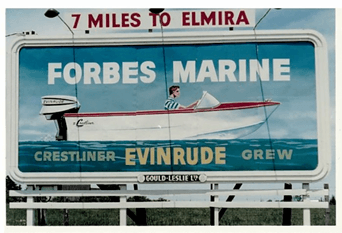 Until 1977, Forbes Motors also operated a branch outlet in Elmira, where along with automobiles, boats and Scott McCulloch out board motors, later representing Evinrude Motors, were sold. They sold Crestliner and Grew boats, Vespa motor scooters, and Frigidaire stoves and refrigerators. In 1977, and still to this day, the location is the Elmira grocery store. Boat ad for our Elmira location. In July 1981, the ownership was taken over by Russell Forbes, and the name changed to Forbes Motors Inc.
New dealer trunk lid logo – 1981 – present. In August 1987, Forbes Motors Inc., was awarded the prestigious Cadillac franchise. This made Forbes the exclusive Cadillac dealer in Waterloo. Cadillac products were now sold alongside GMC, Buick and Pontiac vehicles. In 1990, Ralph and Jack Forbes were approached to support the K-W Regional Police Departments Children’s Safety Village. Located at Maple Grove Road in Cambridge, beside the Regional Police Headquarters, the Children’s Safety Village was created to give young children “hands on” safety training. This village simulates a small city block, as well as classrooms where children are taught safety rules in this miniature setting. Classes cover such items as stranger awareness, pedestrian and traffic safety, fire education, bicycle safety and internet safety. The Forbes’s, along with generous support from their suppliers, constructed a miniature replica of their Forbes Motors Dealership building. This facility houses the fleet of electric cars and bicycles that the children receive instruction with. Annually 20,000 local students visit the village and attend safety classes. For more information, visit the Children’s Safety Village at waterlooregioncsv.com. In February 1997, at the National Automobile Dealers Association convention, Ralph A. Forbes was presented with an Automotive Hall of Fame Distinguished Service Citation. The honor recognizes men and women who have contributed to the automotive industry through their outstanding leadership and achievement. Forbes was one of only six Canadians to be singled out for this award since the Hall of Fame was created in 1940. On October 1st, 1999 Forbes Waterloo Toyota at 583 Colby Drive was added to the Forbes Automotive Family. The dealership name is changed, and now conducts business under the name Forbes Waterloo Toyota and offers full parts and service departments as well as new and used vehicle sales and leasing. Forbes Motors Inc. and Forbes Waterloo Toyota now collectively employ approximately 130 dedicated staff members. In September 2005, Mr. Ralph Forbes was recognized by General Motors of Canada for his 50 years as a General Motors Dealer. In September 2006, Russell Forbes was recognized for his 25 years as a General Motors Dealer. Concluded in May 2006, a major renovation was done on the GM Dealership facility on Weber St in Waterloo. The newly renovated building includes an 18-car showroom, new washrooms, parts and service areas, refreshed service drive through, new customer lounge and many other new customer conveniences. In January 2007, the 4th generation of the Forbes Family joined the company. 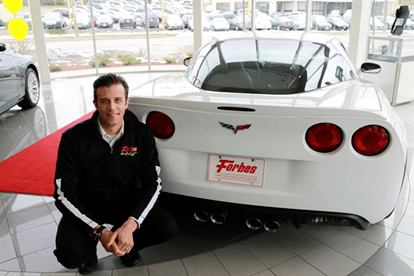 Russ Forbes graduated from the University of Western Ontario from the Richard Ivey School of Business in 2003 and has been with General Motors of Canada as both a District Service Manager and a District Sales Manager for 3 years. 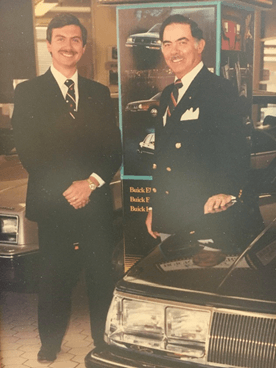 Very few Dealerships have experienced four generations of family and ownership, and we are very proud of our past and very excited for our future. “On a personal note, I am very pleased that one of my first official duties as President of Toyota Canada Inc is to congratulate you on your individual success. You have earned designation in the 2006 President’s Club. The President’s Pride Program is very comprehensive in its measurement criteria and only those dealers meeting exceptionally high standards in all areas of the Dealership’s operations will stand with their peers in the exclusive ranks of the President’s Club. I salute you on your remarkable accomplishment.” It should be noted that only 25 Dealers in Canada win this award annually. “I am very proud of the Forbes Waterloo Toyota Team, they are outstanding employees” said Mr. Forbes. In October 2007, Forbes Collision Centre became the first shop of its kind to convert to a waterborne paint process. This is an environmentally “green” process that is much more environmentally friendly method of painting vehicles. This required expensive new paint equipment and retraining and further demonstrates our commitment to being a good corporate citizen. In November 2007, Parkway Mazda at 115 Northfield Drive West in Waterloo became the newest member of the Forbes Automotive Family. This dealership as of January 2008 has conducted business under the trade name Forbes Waterloo Mazda and will offer a full parts and service department as well as vehicle sales and leasing. Approximately 20 new employees became Forbes Automotive Family members. In June of 2009, General Motors Corporation went bankrupt in the United States. As a condition of receiving a Government financial bailout package, GM was forced to present a scaled down business model to the US Government that would allow the company to return to profitability. 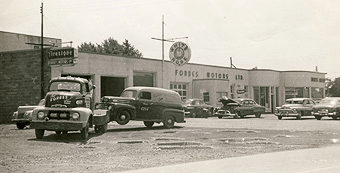 Time marches on, and so does the development of the Forbes Automotive Family. Started in summer of 2011 and completed that Nov, Forbes Waterloo Mazda underwent a complete face lift and modernization of the facilities at 115 Northfield Drive in Waterloo. The new 7 car showroom, new sales and administration offices, new washrooms, new service and parts areas and a modern new customer lounge, was all done to exceed Mazda Canada’s corporate building requirements and to give our customers an outstanding ownership experience. Annually Mazda Canada awards the prestigious title of “Dealer of Distinction” to a select number of their Dealers. Winners have demonstrated outstanding performance, and have excelled in all areas of their dealership operations. In May 2012, Forbes Waterloo Mazda was very proud to have been recognized as one of only 32 dealers in Canada to earn this recognition. We are very proud of the men and women of Forbes Waterloo Mazda who won this honour for us. In 2012, another 4th Generation member of the Forbes Family joined the team. Leigh Forbes, graduated from Georgian College (Barrie) in 2010 with a Degree in Business and an Associate Degree in Automotive Marketing. While attending school in Barrie, she completed her coop terms with the local Barrie Ford Dealership. (Ironic, since the Forbes Family represented the Ford Motor Company from 1921-1940 and from 1948-1955). Upon graduating, Leigh worked for Lexus of Barrie, which at the time, was a brand-new start up dealership. She was one of the original employees. After 18 months, at Lexus of Barrie, she returned to Waterloo where she joined the family business working at Forbes Waterloo Toyota. Currently she is in charge of the “on-line” presence of the Forbes Automotive Family. 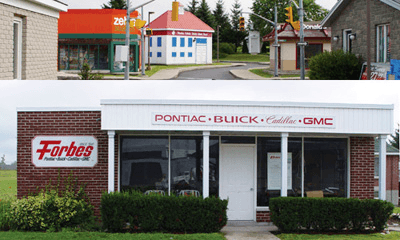 June 2014, five years to the day, after GM had eliminated the Pontiac Brand, Forbes Motors entered into a deal with Schlueter Chevrolet of Waterloo to acquire the Chevrolet brand, and move it from its location at 300 Weber St. N. in Waterloo to our 165 Weber St. S. Waterloo location, along with the Buick Cadillac and GMC products that we already represent. This now gives our Weber St location the entire lineup of General Motors products being marketed in Canada. The Staff at Forbes Motors wish to announce the passing of John “Jack” Brooke Forbes on May 7, 2013 at the age of 92. It is with a very heavy heart that we announce that “Brother Jack” has passed. An outstanding Man that was admired and trusted by all that knew him. A decorated WWII hero he gave far more than he took. He is missed but never forgotten. November 2013, the Forbes Automotive Family announced that they are relocating their Toyota location. The Schlueter Chevrolet location was acquired to become the new home of Forbes Waterloo Toyota. The facility underwent a major renovation and was opened for business in the Summer of 2014. Once completed, the operations of Forbes Waterloo Toyota were relocated from 583 Colby Dr. Waterloo to 300 Weber St. North in Waterloo. This new location is more than twice the size of the current store on Colby Dr., and will include new amenities like a 6-car drive through service department and a large 15 vehicle showroom. Our business has steadily grown, and with the volume of quality Toyota products that we sell annually, the Dealership has outgrown the present site. Ironically, when the 300 Weber St building was built, in the early 1970’s, it was operated as a Toyota Dealership in Waterloo. Tuesday, October 14, 2014 we officially opened the doors at 300 Weber Street North Waterloo. This is the new, state of the art home for the all new Forbes Waterloo Toyota. The Staff at Forbes Motors wish to announce the passing of Ralph A. Forbes on September 11, 2014 at the age of 90. In January, 2017, the ownership of the Forbes Automotive Family was taken over by Russ Forbes, making him the 4th generation of the Forbes Family to own and operate the Automotive Family. In September, 2017 Fox Harley-Davidson in Owen Sound Ontario was added to the “Forbes Automotive and Motorcycle Family”. The Forbes Family have had a long-standing business relationship with the Fox Family for many years and we eagerly entered into this new venture with the great staff in Owen Sound. Located on Highway 6 south of Owen Sound and north of Rockford, Fox Motorcycle Company is the franchised Harley-Davidson Dealership in the Owen Sound market. Sales of new Harley-Davidson Motorcycles, all brands of used motorcycles, plus parts, service, and collision repair plus heated winter bike storage, are all offered from this location. The staff is 99% unchanged, and it is our commitment to maintain the outstanding reputation the Fox Family has earned. 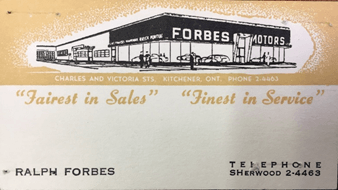 2021 will mark 100 years of the Forbes Automotive Family history in Ontario. As pioneers of the industry, we have had a long history and we hope this summary was of interest to you. Since 1921, we have grown to currently representing four manufacturers, General Motors, Toyota, Mazda and Harley-Davidson, selling over 4,000 cars, trucks and motorcycles a year with over 175 full and part time employees and sales volumes of 150 million dollars per year. The future is in good hands and we look forward to the next 100 years!